Sometimes I think back fondly on part of my life, savoring the memory of some fine meal, event, or time spent with those I love. Then I make the mistake of counting back the years, and my jaw drops so fast it almost hits the table as I realize that the event happened HALF MY LIFE AGO or has a giant number like SEVENTEEN YEARS AGO. Such is the case with this recipe. 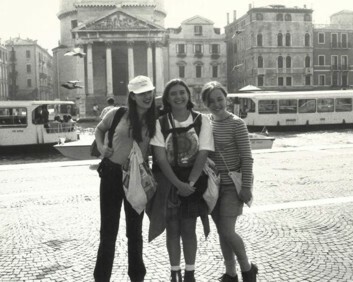 Back in 1994, I spent a semester in Italy where I took classes in Italian, art history, and cooking. Also, I talked smart, played countless hands of gin, and drank wine on some of the finest/pigeon-poop laden piazzas in Italy. Here I am, the spring chicken in the middle. One of the recipes we learned to make is Involtini al Carciofi (that last bit means artichoke, and it is pronounced like car-CHO-fi), which is basically a layered meat and cheese roll with an artichoke tucked into the middle. The original recipe uses veal, but since I have a freezer filled with venison, I’ve made the substitution. [As always, substitute away! No venison? Use veal. Hate veal? Use beef? Don’t eat meat? Skip this one). I should also note, that I varied from the original recipe in a whole bunch of other ways, but the general concept is still the same. If you want to make a more traditional version of this same recipe, use prosciutto instead of the ham, fontina instead of the provolone, and tuck a few sage leaves inside and skip the Italian seasoning. As you can see, pretty much the only thing I left totally alone in this recipe is that I still included the artichoke, which is basically required since it is in the name. Whether you choose to make this as written, the traditional way, or with your own substitutions, involini are pretty easy to make and very delicous. Place the venison between two sheets of plastic wrap and place on a hard surface. Using a cooking mallet or heavy measuring cup, pound until very thin. Repeat with each cutlet. Place a single slice of ham on each cutlet, top with provolone, and place artichoke heart in the center. Starting on one end, roll, tucking the inside contents inside the venison. Secure with two toothpicks. In a bowl, mix flour, Italian seasoning, salt and pepper. Roll each involtini in the flour mixture until it is fully coated. Over medium-high heat, add oil to a large skillet and heat until oil is very hot (I drop a bread crumb in the oil to test it – when it is ready, it will sizzle around the bread crumb). Place the involtini in the pan and cook for 3-4 minutes a side or until well browned. Pour wine into the pan and cover, reduce heat to low then cook for 30-40 minutes. Turn the involtini occasionally. 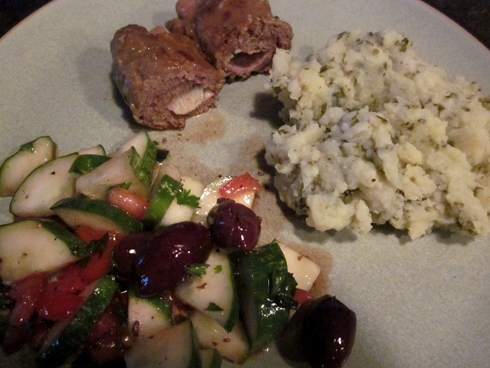 The contents of the involtini will ooze out a bit, and eventually will thicken into a sauce. Before removing from pan, stir the involtini around the pan to coat in a layer of the thick sauce. Remove toothpicks and serve. Notes: You can substitute beef or veal for the venison, and omit the provolone if you’d like to make this dish non-dairy. If it makes you feel any better, it seems like yesterday to me that you were getting ready to go to Italy. 17 years ago? Holy crap… Makes me feel old too.